Demanding applications, such as steam turbine control, require reliable shut down capability in failure situations. Utilizing a closure spring and a unique fail safe electromagnetic (EM) clutch, Diakont fail safe spring EMAs provide 100% guaranteed valve closure during fast-trip scenarios. In the event of a trip command from the control system, loss of communication, or loss of power to both EMA channels, the output shaft will immediately close the valve under the spring’s force. The system automatically reengages within four seconds. Diakont is a trusted supplier of industry-leading dual-redundant and fail safe electromechanical actuators (EMAs) and control systems for the energy industry. Diakont EMA solutions allow customers to replace hydro-mechanical motion control systems with electro-hydraulic or fully electric solutions for valve control. Diakont EMAs incorporate progressive technology, including precisely machined roller screws and high-force permanent magnet synchronous motors (PMSM). These components are integrated into a single unit, thus providing exceptional performance in a compact footprint. Diakont actuators and turbine control systems have improved plant performance by providing greater responsiveness, safety, and stability, as well as more precise control and reduced maintenance challenges. Diakont has successfully upgraded dozens of steam turbine control systems that incorporated dual-redundant EMAs, leading to impressive results. Diakont’s steam valve control systems have been shown to reduce the variance of full-load backpressure from ±4.25 PSI to ±0.5 PSI, increasing power output by 2.0 MWe per reactor with no corresponding change in thermal power output. 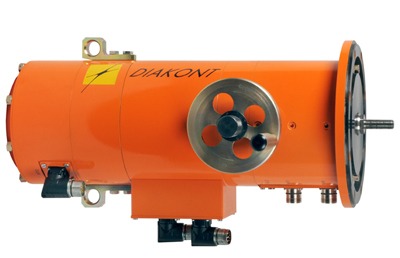 Plus, Diakont actuators are able to complete a full linear stroke in less than 50 ms, which increases turbine safety and overspeed protection.